Riders for the Storm !! A recent report from Aon Benfield highlights the true financial costs of severe storm systems, and the resulting insurance claims. With an initial suggestion of $2 billion losses across the US for the month of March, the sums for the insurance industry continue to be significant and, according to Aon’s Steve Bowen, thunderstorms have overtaken hurricanes as the ‘costliest peril’ for the US industry over the past ten years. With thunderstorms producing tornadoes, hailstorms and windstorms the potential losses from these infrequent but high-impact events is a tricky one to predict, especially with a rapidly evolving urban landscape spiking the historic data. However, there are options available to insurers to lessen the risks, such as thunderstorm modelling, and these options can be used when making risk management decisions, decisions which don’t necessarily translate into higher premiums for the customer. Instead modelling can help insurers to increase the profitability of their portfolios by strategically pricing policies, identifying and closing any risk build-ups and instigating effective methods of risk transfer. But if we continue to see an increase in the frequency or severity of these losses, when will we see a change in the rates charged by the insurers? Severe storm systems leave more in their wake than death and destruction — including insurance claims. And they're piling up. 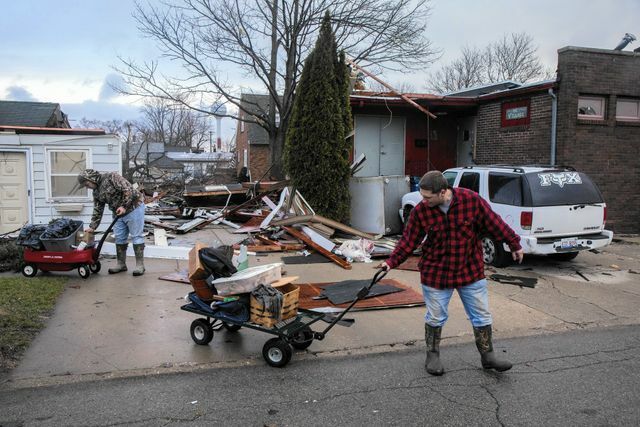 Strings of destructive storms in the U.S. throughout March are expected to cost the insurance industry more than $2 billion, according to a report from Aon Benfield, the global reinsurance branch of London-based Aon.